« Are there any crystals I can wear to enhance beauty? I think I have an energetic allergy to brooms, mops, Mr. Clean, and SOS pads. Just the thought of my cleaning supplies makes me dizzy and weak, and I find that I just can’t seem to get off the couch. But once I move through the resistance and actually put these things to use in my home, I feel like a brand new person in a brand new space. Sprucing up your living environment is always a good start to feeling clearer, but what about spring cleaning for the soul? Now is a good time to really use some elbow grease and get after those dusty corners of your auric field. It’s time to sort through all of those old experiences and traumas and get rid of the clutter. And a little rearranging of the big pieces might create a much better internal feng shui and energy flow. If all of this sounds too daunting to do alone, might I suggest calling for crystalline back-up? Covellite, also called the blue healer, is a metallic, indigo stone that has a powerful vacuum cleaner effect for your mind, body, and spirit. Not only does it help clear out what no longer serves; it can also heal underlying patterns of distortion and move you into the higher spectrums of reality. Covellite is an essential powerhouse stone for those on a spiritual path, and investigating its physical and chemical features explains why we can all benefit from working with it. It is a copper-based stone, and stones with a copper content have a natural ability to pull out stuck energy, unhealthy mental and physical patterns, emotional traumas, and any lower energy that no longer serves us. They also promote energy flow through the chakras and meridians. In this way, they are Gaia’s gift for auric clearing and maintenance. Covellite’s color rays are as deep, electric, and mystical as its powers. 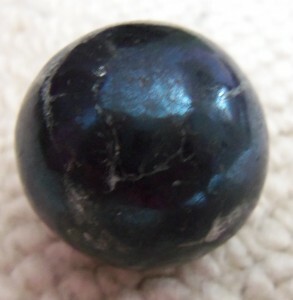 Most specimens that you see are in the dark indigo family, with a metallic sheen. Sometimes you also get hints of a purple-rose iridescence, as in my beautiful piece (pictured here). Indigo, copper-based stones have a specialty of activating and clearing the higher chakras and spiritual levels of the being, getting to the karmic root of issues that are plaguing you on the physical, mental, and emotional levels. That is why Covellite is prized as a healing and meditation tool. It can activate your third eye and higher understanding of why certain situations have manifested in your life based on your entire soul history. Covellite then brings in higher dimensional healing energy to transform these patterns once and for all. Covellite is the blue healer, because it has the vibrational flexibility that allows it to connect to the highest levels of the being, while also getting down to the gross physical level and assisting with healing miracles in the body. Covellite is a godsend when you are facing cancer. 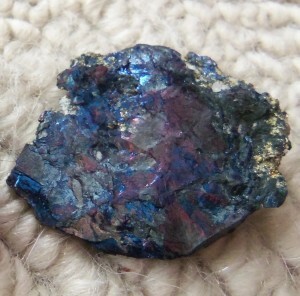 According to Crystal Expert, Melody, “This mineral has been used in the treatment of cancer, to stimulate disordered cells to re-order themselves and to purge any toxins from within the body.” I have personally seen Covellite help a client to beat cancer, and I believe that it has a similar level of effectiveness with other serious illnesses that have a karmic cause. Meditate with Covellite on the third eye, while holding the intention that you want to see and heal the root cause of an illness. The copper inside of Covellite will begin to draw the emotional or mental pattern to the surface of your awareness so that it can be released. I highly suggest placing Covellite over an area of the body that requires healing. You can begin to feel its energy permeating into the cellular level, infusing higher energy. And if you really tune in, you can feel a tangible sensation of reordering and restructuring happening, as if energetic building blocks are being stacked and placed into a stronger foundation. It’s a feeling of coming into wholeness, of establishing the blueprint for healing firmly within you. Covellite strongly activates your third eye and intuitive abilities, and it is a perfect stone to support psychics and healers in bringing their work to a higher level. It can be worked with to explore your Akashic records. With the help of Covellite, you can journey to other lifetimes on this planet, and even in other realms, so that you can connect with your gifts and integrate other aspects of yourself. Because Covellite has a grounding quality that can bridge the higher realms and physical reality; it can activate abilities you had in other existences, so that you can work with them here. Perhaps you discover a lifetime where you were artistic. Covellite can help you to tap into the part of your etheric DNA where these skills are stored, so that they can begin to express in your current life. If you would like to invoke the help of the blue healer, here is a wonderful exercise you can do to scan your body and clear old patterns. You will need one Covellite stone, that you should cleanse before and after you work with it. Lie down in a comfortable position, and then place the Covellite on the center of your forehead at the third eye point. Focus on your breathing and take several nice, deep breaths, allowing yourself to relax and come into a meditative state. Call upon your higher self, and feel the love and higher energy coming in and connecting with you. Bask in this feeling. Now ask your higher self and the Covellite to assist you in tuning into your body. Hold the intention that you are doing a scan to discover if there are any areas of the body that are holding lower vibrating patterns or illness that is no longer serving you. Allow the information to come in any way that you can best receive it. Some of us are visual. If this is you, you might try visualizing yourself floating above your body and seeing if there are any areas that stand out as being shadowed or having a physical indication of blockage. Some of us feel things in our body, so you might feel a heat, tingling, or a twitching sensation in an area. If you have developed clairaudience, or the ability to hear messages, your higher self might tell you where you have a blockage or an issue in your body. Or you might just know. The trick is to trust whatever is coming to you. Once you have an idea of where you are storing lower energy, hold this intention: “I am ready now to understand what this is about, to release the root cause. Please reveal to me what I need to consciously understand for complete healing to occur.” Take some more deep breaths, and just allow your higher self and the Covellite to surface what you need to know. You might have a memory surface from this life or another life that will reveal to you the energetic, emotional or belief pattern you have been holding. You might just get a subtle feeling or knowing. Advice or guidance about how to shift it might also come to you. Be sure to take note and follow through with any ideas you might receive. It is also possible that you might not get anything significant on a conscious level, and that is OK, too. Trust that you are creating healing for yourself, and that it is unfolding perfectly for your highest good. Now that you have more information, you are ready to begin healing this area. Place the Covellite directly over the area where you sensed the blockage, illness, or lower vibrating energy. Place your hands over the Covellite, and allow healing energy to flow. You can ask your higher self and any other spiritual helpers to assist with divine intervention, healing, and highest good. Breathe and just be present, noticing what you notice. You might actually sense the lower energy being absorbed by the Covellite, or perhaps you will feel an infusion of higher healing energy permeating down into the cellular level. Leave the stone in place for at least fifteen minutes at a time. You can repeat this last step on a daily basis if you are facing a health challenge. Allow Covellite to assist you with your deep cleaning, and I know your life will sparkle in new ways.